And while voters generally said little progress has been made over the last eight years across major areas, Trump backers said things had gotten worse across the board, while Clinton supporters saw more improvement, especially on the economy. The national online survey was conducted in the two weeks leading up to the presidential election (from October 25 through the morning of November 8) among 3,788 registered voters who reported they had already voted or planned to vote. The survey was conducted on Pew Research Center’s nationally representative American Trends Panel. Fully 79% of Trump voters said illegal immigration was a “very big” problem in the country today, while just two-in-ten Clinton voters (20%) said the same. Nearly three-quarters of Trump supporters (74%) saw terrorism as a very big problem, compared with 42% of Clinton supporters. Crime and job opportunities, including job opportunities for working-class Americans, also were rated as more serious problems by Trump than Clinton voters. Conversely, climate change ranked as a leading problem among Clinton supporters (66% cited it as a very big problem), but near the bottom among Trump voters (14%). Clinton backers also saw gun violence and the gap between rich and poor as much more serious problems than did Trump supporters. Both racism and sexism were viewed as more serious problems among Clinton voters than Trump voters. About half of Clinton voters (53%) said racism was a major problem, and 37% said that about sexism. That compared with 21% and 7%, respectively, among Trump voters. Among 13 issues, the gaps were fairly modest on only two – drug addiction and the condition of the nation’s roads, bridges and other infrastructure. Majorities of Trump supporters (62%) and Clinton backers (56%) said drug addiction was a very big problem. Clinton backers (46%) were somewhat more likely than Trump supporters (36%) to cite infrastructure as a major problem. The survey also found wide differences between Trump and Clinton voters over how best to address the nation’s problems. Nearly two-thirds of voters overall (65%) – including an overwhelming share of Clinton supporters (84%) – said the more effective way to solve problems is with proven approaches that solve problems gradually, even if change may take a while. But Trump voters were divided on the best approach to solving problems in this country. 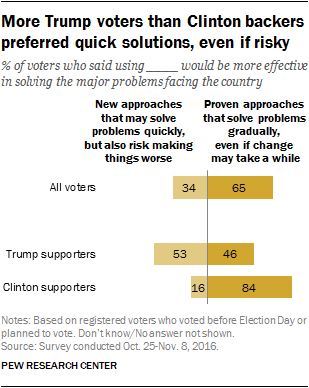 About half (53%) favored “new approaches that may solve problems quickly, but also risk making things worse.” Conversely, 46% of Trump backers preferred a proven, if slower, approach to problem-solving. Overall, relatively few voters thought the country had made progress on most issues since 2008. The economy was the only one of seven about which roughly as many voters said things had gotten better (38%) as worse (43%) over this period. Roughly two-in-ten (18%) thought it has stayed about the same. But more voters said the job situation in the U.S. has gotten worse (44%) than said it has gotten better (35%), and by nearly two-to-one, voters were more likely to think the country’s security from terrorism has gotten worse than to think it has gotten better (45% vs. 23%). Majorities of voters said race relations (67%), the country’s standing in the world (61%), crime (57%) and the immigration situation (55%) in this country had each gotten worse since 2008. Trump voters took a uniformly negative view of progress over the past eight years: Majorities of Trump supporters said things had declined in all seven areas – from 87% who said the U.S. standing in the world had gotten worse to 69% who said the same about the job situation. By contrast, Clinton supporters gave mixed views of the progress the country has made over the last eight years. Majorities of Clinton voters said both the economy (67%) and the job situation (60%) have gotten better since 2008, while far fewer thought either has stayed the same or gotten worse. Voters who back Clinton were divided on other aspects of the nation, however. While 37% thought security from terrorism in the U.S. has gotten better since 2008, about as many (41%) said it has stayed about the same, and 22% thought it has gotten worse. 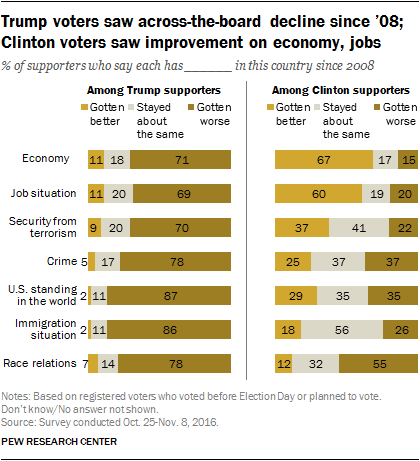 A 56% majority of Clinton supporters said the immigration situation in the U.S. has stayed about the same since 2008, while about a quarter thought it has gotten worse (26%) and 18% said it has improved. More Clinton supporters said race relations have gotten worse in this country than said this about any other issue: 55% thought this, compared with just a third (32%) who thought race relations have stayed about the same since 2008. Only about one-in-ten (12%) said they have gotten better. As Election Day approached, voters looked ahead to the next administration with a substantial measure of pessimism. Voters had little confidence that the new Trump – or Clinton – administration would be open and transparent, improve the way government works or set a high moral standard for the presidency. Across five specific areas, majorities of voters gave negative marks to a possible Trump presidency: 61% said that if Trump were elected, he would definitely or probably not set a high moral standard for the presidency; 57% said he would not improve U.S. global standing; 55% said he would not improve the way government works and the same percentage said he would not run an open and transparent administration. About half (52%) said he would use his office to improperly enrich himself or friends and family. Clinton also was viewed quite negatively; in fact, nearly two-thirds of voters (65%) said she was unlikely to run an open and transparent administration (55% said this about Trump). Clinton also was viewed as less likely than Trump to improve the way government works. However, more voters thought Clinton (48%) than Trump (42%) would improve U.S. standing around the world. Even beyond the political and ideological divides between Trump and Clinton supporters, the two cohorts showed striking differences in how they describe themselves, both in terms of attributes, lifestyle and personal affiliations. The survey asked respondents to check each description that applied to them. Notably, the widest gap in views between Trump and Clinton supporters was over whether the term “traditional” described them. About seven-in-ten Trump voters said it did (72%), compared with just 31% of Clinton voters. An overwhelming share of Clinton supporters (87%) thought “open-minded” describes them well – the most across any of the eight attributes. A smaller majority of Trump supporters (64%) thought the same of themselves. There also was disagreement between supporters on what core values describe them well. Among Trump supporters, 59% said “honor and duty” described their core values, while about a third (35%) of Clinton backers said this. By contrast, three-quarters of Clinton supporters said “compassion and helping others are my core values” described them well, while a smaller majority of Trump backers said the same (58%). Similarly, a strong share of Trump backers (72%) said “think of myself as a typical American” is an apt descriptor. Far fewer Clinton backers (49%) said the same. And while more Trump backers than Clinton supporters would think of themselves as “blue collar,” relatively few across either of the cohorts described themselves in this way (33% of Trump supporters, 19% of Clinton supporters). Supporters also were distinct in their associations. 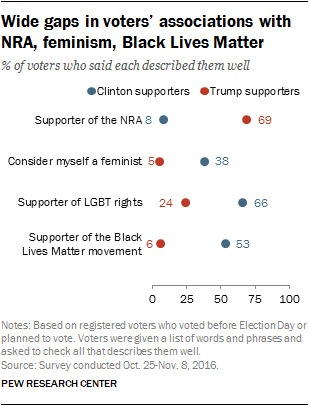 A wide majority of Trump supporters (69%) said “supporter of the National Rifle Association” describes them well, more than eight times the share of Clinton supporters who said the same (8%). Conversely, Clinton supporters were more than twice as likely as Trump supporters to say “supporter of rights for lesbian, gay, bisexual and transgender people” describes them well: A two-thirds majority of Clinton supporters said this, compared with just about a quarter (24%) of Trump supporters. Just about half (53%) of Clinton supporters said in the weeks before the election that “supporter of the Black Lives Matter movement” describes them well, including roughly three-quarters of black voters who supported Clinton (73%) and about half of white voters who supported her (51%). By contrast, just 6% of Trump supporters described themselves as supporters of the Black Lives Matter movement. While only about four-in-ten Clinton supporters (38%) said “consider myself a feminist” is an apt description, this is far greater than the share of Trump supporters who thought the same (5%).